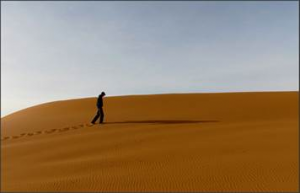 We enter these 40 days of Lent contemplating and accompanying Christ entering the desert to be tempted. To do this. we all decide a sacrifice to offer this Lent in reparation for our sins. We offer the sacrifice with the hope of finding God. The sacrifice is hard and our experience is that we feel unable or small before the task that lies before us. Lent becomes a time of challenge and sometimes, even darkness. This is when Lent achieves its goal. It is in our weakness that we are able to find God. However, it isn’t we who find Him, but rather God who comes to have mercy on us. He finds us in our smallness to bring us to Him. The desert is the place where God can find us. We have to go to the desert. We need to make the experience of the desert repeatedly. He is the only one who can save us. The desert is where we alone with ourselves and with no securities. Only alone in our heart can God come in. God is looking for us we have to help Him find us. Fr Andrew Gronotte, born and raised in northern Kentucky entered the Legionary apostolic school in eighth grade in 1998, where he began his formation for the priesthood in the Legion. Currently he is finishing his theological studies in Rome, where he will be ordained in a little more than a year.